If you are looking for a performance laptop where you can multitask and operate seamlessly with an enhanced user experience, then the ThinBook is just the right device for you. The ThinBook 1430-EC1 comes with a sleek body and a metallic grey finish, this 14.1-inch device that will serve as a perfect BYOD Device. It’s perfect for travel, work, vacation, and even as an entertainment tool. The powerful 10,000mAh battery lets you work efficiently for 8.5 hours without worrying about plugging for a charge. 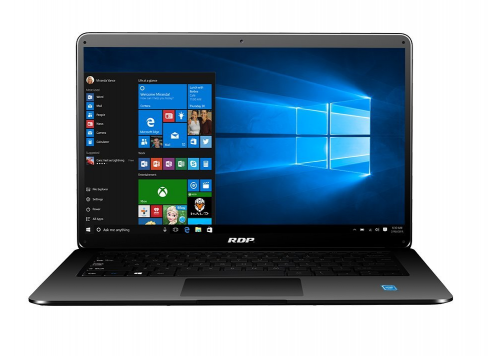 The real advantage is the performance, size and weight which is the thinnest, lightest and longest-serving laptop packed with powerful Intel 1.92 GHz Quad Core Processor and comes with a preloaded Windows 10 OS. An in-built RAM of 2GB and a storage capacity of 32GB (expandable up to 128GB) make this laptop stand out from the crowd. You will thoroughly love owning the ThinBook as this lightweight laptop can easily fit in smallest places of in your travel/work luggage no matter where you go. How cool is that? With a portable sleek design and incredible product features, this device truly gives you an exceptional experience. Improve your computing experience with the ThinBook. Get it today!